Members in the original Old Farts Car Club from the state of Iowa. This the only existing roster that we could find for the Old Farts Car Club from the state of Iowa. Below are the names from the state of Iowa. See if your name is on the roster from Iowa. Original members from the state of Alabama are on the left. See if your name is there and if not, lets put it on. Sent us stuff of interest from the state of Alabama if you know of any and we will post it forthwith. That means right now. These photos below are some beautimus Old Fart Fartettes at Des Moines. Great sense of humor is part of b eing a fartette. 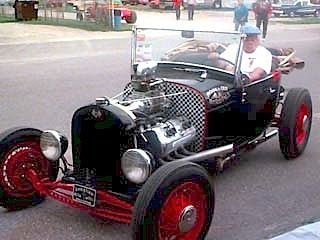 Here is a picture of Dennis Lukari, old time hotrodder at Des Moines Goodguys, and his 1929 Ford Roadster pickup with the Ardun flathead power plant. 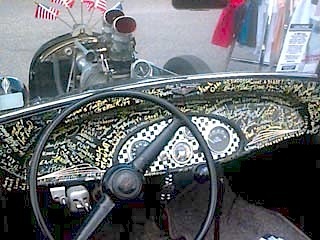 This dashboard has many famous signatures from rod runs around the country.